"Hey El Gato, I saw a couple of really interesting pictures recently which have given me a few ideas including a shot that I want to do with you. I just need you to sit there for a minute and look straight into the camera. Directly at it." "No, not rub your face into the lens, just sit there and look straight into it." "No, I don't want you to give me a leg rub, just sit there and look into the lens." "No, lying upside down and rubbing your head across the concrete isn't exactly what I have in mind. I need you right side up, and looking into the camera. Just for about a minute, that's all I need." "Oh sod it, it's not what I had in mind but it'll do for now. We'll try again some other time." © 2004-2016 AKMC. May not be used, copied or reproduced without written permission. Lucy knew this would make a great image. Well done anyway, with such limited co-operation. LOL. That's exactly what it's like photographing a cat. Dogs are so much easier. 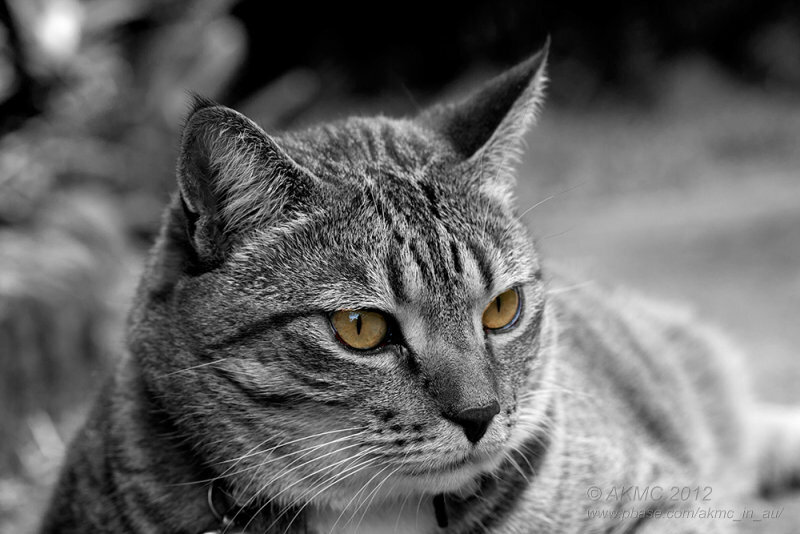 Love this pretty kitty and great selective coloring on the eyes. V.
Very nice! I am not a super fan of the B&W with specific color added, but this is subtle enough to be just right. I've thought of the same shot, but have not mastered the post editing skills to pull it off.